Want to put Climate into electoral politics? Are you appalled at the “Climate Silence” in past elections? So is 350 Bay Area, and we’ve endorsed an effort to “Make 2018 a Climate Election“. Movement-building and raising public awareness is part of our mission, and this multi-group campaign (not a new organization) fits right in. It’s time to talk climate. 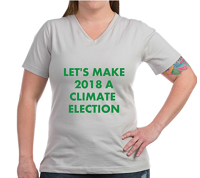 The idea started with the founders of ClimatePolitics who are calling for a loose San Francisco Bay Area Action Group to take on the first creative steps: slogans, memes, tweets, videos, buttons, bumper stickers, t-shirts, etc. in preparation for taking the effort national. If you’ve ever wanted to help voters consider the climate crisis, this is a great chance to make an impact nationally. Let’s end the climate silence where it counts, in the voting booth. If you’d like to lend a hand to this effort, creatively or with outreach, click to join their email list. Disclaimer: The author serves as Project Manager with ClimatePolitics.